Cable shielding is a key component in protecting critical and essential airplane systems from the damaging effects of lightning strikes, high-intensity radiated fields, and other potentially harmful environmental hazards. The advent of fly-by-wire airplanes such as the 777 has further increased the importance of this protection. Boeing has developed a portable loop resistance tester for airplane maintenance personnel to use when testing cable shields and shield connections in airplane wire bundles. The loop resistance tester has proved to be a significant improvement over previous test methods, offering operators substantial time and labor savings together with a decreased likelihood of error. The tester is portable, operable by one person, usable on a fueled airplane, and allows totally nonintrusive testing for both overall loop and joint resistance measurements. Causes and results of environmental damage to airplane systems. Mitigation of damage to airplane systems. Shielding system concepts and testing. Loop resistance tester description and operation. Critical and essential airplane systems are vulnerable to damage from environmental factors. These include lightning strikes, HIRF, moisture, extreme change in pressure, extreme range of temperature, vibration, and shock. These electromagnetic fields are created at the airplane surface, inducing voltages inside the airplane that can cause damage to electrical equipment or cause it to malfunction indirectly. The resulting effects, known as lightning indirect effects, range from tripped circuitbreakers to computer malfunction to physical damage of input or output circuits in electronic equipment. HIRF is generated by various radio frequency (RF) emissions such as high-power radio and television signals and radar. It is similar to the electromagnetic fields induced by lightning and can also affect the proper functioning of critical and essential systems. Low-intensity RF can originate from personal electronic devices (PED) such as laptop computers and cell phones used by passengers in flight (see �Electromagnetic Interference From Passenger-Carried Portable Electronic Devices� in this issue). These low-intensity devices can also affect critical and essential systems. Electromagnetic interference from PEDs is suspected as the cause of many unexplained flight control upsets. Another environmental condition that damages airplane systems is moisture from rain and salt air, which continually bathes external wiring and connectors. Wide pressure swings from altitude changes, in conjunction with extremes of temperature, literally force moisture into connectors and junctions. Small air cavities in connector backshells are susceptible to internal condensation even if completely sealed to outside air. Climbout from airports where temperatures reach above 100�F (38�C) to flight at 40,000 ft, where temperatures can fall below -67�F (-55�C), causes these air pockets to shrink and draw moist outside air inside. Descent from low-pressure 40,000-ft altitudes through clouds and rain forces moist air into connector cavities when outside pressure builds at lower altitudes. This effect can occur even in pressurized areas of the airplane. Airframe vibrations and shocks from landings and turbulent flight can loosen fasteners and connectors, creating additional paths for moisture to enter. This inevitable infusion of moisture causes corrosion. Corrosion degrades electrical ground paths through a chemical interaction between metal and another element, usually air (oxygen), water, salt, or chemicals such as Skydrol. The shield grounding techniques used on Boeing airplanes involve metal-to-metal contact at junctions. The presence of oxygen or water causes an oxide to form between the contacting surfaces. The oxide is an insulator, which limits the flow of electrical current. Gradually the resistance across the junction increases and, over time, the electrical junction can be completely broken. Degradation of this type results in a higher resistance path to ground, which allows greater coupling of lightning or RF currents to internal wiring. This degradation is not evident to maintenance personnel, and extreme instances of corrosion or loosening of connectors can completely unground the shield. If electronic equipment needs to be operated in a region subject to changing electromagnetic fields, and if the currents generated by these fields are considered harmful, the recommended approach to mitigating the harmful effects is to shield and ground the electronic equipment and the interconnecting wiring. As a result, electrical currents generated by lightning or HIRF then circulate through the equipment enclosure to ground without affecting internal circuitry. This enclosure practice extends to interconnecting wiring through the use of cable shielding; that is, the shield is the enclosure that is grounded. Other damage mitigation considerations include the location of the equipment and wiring, use of effective wiring, use of good grounding practices, and building equipment to withstand transients. All these tactics are incorporated into the design of Boeing airplanes and the installed equipment. Boeing has studied data from a large number of lightning strikes to characterize the voltage and current generated. These data were used to determine the level of transient (short-duration) voltages that might affect the airplane and the installed electronic equipment. If electronic equipment is designed and certified to withstand certain levels of transient voltages, the equipment enclosure and cable shielding must perform at a level to keep the transient voltages below those levels. Lightning strikes vary in intensity and duration. When designing airplanes, Boeing assumes that all lightning strikes are of high intensity and duration and, therefore, a certain amount of current must be shunted to ground to minimize the amount that is indirectly coupled to internal wires. If the resistance of the shield circuit rises, less current is shunted to ground and the likelihood of damage to internal equipment increases. Measuring shield path resistance directly indicates what voltage level will be reached and allows testing limits to be established for determining when corrective action must be taken. A new shielded cable properly installed will exhibit a certain amount of resistance in the shield circuit. By monitoring this resistance, maintenance personnel can determine the ability of the shield to protect internal wiring. Any increase in resistance indicates that a problem is occurring in the circuit, such as corrosion at a junction or loose hardware. When the resistance reaches a certain level, maintenance personnel must take corrective action, usually by cleaning the affected junctions, securing loose connections, or replacing the cable. The U.S. Federal Aviation Administration (FAA) has mandated maintenance actions for certain critical systems to ensure that the shielding used on them provides continued protection over the life of the airplane. These actions include operator-scheduled maintenance and Boeing validations of this maintenance. Operator maintenance includes visual inspections for corrosion and loose hardware, and electrical testing of the ground path for minimal resistance. Boeing validation involves sample testing of in-service airplanes to verify the effectiveness of scheduled maintenance and to investigate additional system integrity. Airplane designers must base their techniques for shield grounding on the assumption that moisture is inevitable and that the use of corrosion-resistant materials and sealants is mandatory. Using corrosion-resistant materials involves several compromises, however. An example is corrosion-resistant stainless steel (CRES), but it is heavy and does not conduct electric current easily. Also, CRES is only corrosion resistant and not corrosion proof. Consequently, connectors are made of lighter materials such as aluminum, which is a good conductor of electricity. Because aluminum corrodes quickly in salt air, it is usually plated with nickel and cadmium for additional protection. However, time and exposure eventually will cause all materials to corrode. This is the main reason the FAA has mandated specific maintenance actions on certain airplane models for monitoring exposed shield paths to keep them functioning over the life of the airplane. Shields perform other functions beyond providing lightning and HIRF protection. A well-known example is low-frequency hum on airplane audio circuits usually traceable to the 400-Hz power system. The traditional solution is to install a shield and ground it at one end, which has proved to be very effective against this type of low-frequency interference. Grounding the shield at both ends is typical for lightning protection, but this tactic was found to be ineffective against the low-frequency hum. One of the effects of a lightning strike is the generation of changing electromagnetic fields inside the airplane hull. These fields are at much higher frequencies than the 400-Hz power interference. Under such conditions, shields grounded at only one end might not be effective. In some cases this can also result in the shield acting as an antenna, thus making the surge voltages even larger than they would be if the conductors were unshielded. No single point on an airplane can be considered "ground," so the entire airplane structure is typically used as a ground. If a shield is grounded at both ends of a cable, circulating currents go into the structure and return through the shield ground path at the other end, creating a loop. The circulating loop current cancels the magnetic field that produces common mode voltages. This concept is directly counter to the reason for establishing a single-point ground and calls for shields to be grounded at both ends. However, installing dual-shielded cable with the inner shield grounded at one end and the outer shield grounded at both ends eliminates hum while maintaining lightning protection. If circulating currents mitigate the effects of electromagnetic fields, keeping the shielding loop resistance low will maximize the protection. Testing for this low resistance is a direct measure of the protection. Initial methods developed to measure resistance in shielding involved disconnecting the cable connector and measuring the resistance with an ohmmeter. Because ohmmeter testing involves injecting a fixed current into the path and measuring the amount of voltage that results, the path must be isolated from any other path to measure a particular resistance. If the path is not broken, the ohmmeter current can flow in multiple directions, making it impossible to accurately measure the resistance. This intrusive approach disturbs connectors, is time consuming, and does not ensure a good reconnection. When testing is disturbed in this manner, a system functional test must follow to verify that the system still performs as intended. Initial attempts to test shielding circuits nonintrusively included using a laboratory network analyzer with wraparound probes to couple a voltage to the shield and sense the resulting flow of current. Although accurate, this configuration was difficult to set up, required long probe leads, was not suitable for field use because it was not portable or waterproof, and required 115 V ac power. To avoid encountering these circumstances during resistance testing, Boeing developed the LRT to provide a nonintrusive testing technique that will not disturb connectors, is faster, and will ensure the soundness of the overall circuit. To properly use the LRT and achieve the best results possible, maintenance personnel should understand the following about the device: LRT elements, LRT technique, loop troubleshooting, joint mode, sensing of coupler closure and joint probe connection, maintenance requirements, safety features, and calibration and certification. The LRT comprises four elements: a drive current coupler, a sense current coupler, joint probes, and an instrument assembly containing the LRT battery and processor. The battery allows the LRT to be used continuously for 8 hr without recharging. The LRT technique is patterned after the laboratory network analyzer approach that induces a voltage on the shield through a wraparound probe and measures the current flow through another similar probe. The shield shown in figure 2 acts as a conductive loop, going through the structure, connector, cable shield, connector, and back to structure. When a coupler is connected to this loop, the coupler forms the output winding and magnetic core of a transformer, and the shield loop forms the input winding of the transformer. When a voltage is forced on the coupler winding, a voltage is then forced around the shield loop. The impedance of the loop can then be found by measuring the current around the loop. To keep the coupler operating as closely as possible to ideal conditions, the LRT uses two couplers. A drive coupler drives the voltage around the loop, and a sense coupler senses the current flowing in the loop. The maintenance person places both couplers on the shielded bundle and presses the start switch to start a loop measurement (fig. 3). The LRT approach is to numerically �demodulate� the voltage and current waveforms to create a phasor representation of the loop voltage and loop current, then take the real part of their complex ratio. To create the phasor representation, the voltage and current waveforms are multiplied by sine and cosine waveforms and summed. The ratio of the voltage and current phasors produces the complex loop impedance, the real part of which is the loop resistance (fig. 4). Once a shield is found to have a resistance value that is larger than allowable, the problem must be isolated and fixed. Maintenance personnel can do this by disconnecting the cable in question and testing it with a bonding meter. The cable connector must be rotated to remove it, however, and the corrosion may be cut through in this process. If this happens the cable may appear to be in good condition, making it impossible to find the problem area. The cable may be returned to service and will continue to corrode, potentially jeopardizing the system while the airplane is in operation. The LRT was developed to allow maintenance personnel to test for a poor connection while the cable is still installed. The LRT is also helpful when a problem can be fixed without removing the cable because many cables are difficult and costly to remove and replace. To troubleshoot a bad loop, the LRT is used in joint mode. In this mode, instead of measuring the loop voltage and the loop current, the LRT measures the voltage across a joint (joint voltage) and loop current. Given the joint voltage and loop current, the joint impedance can be measured in the same way that the loop impedance was measured. The joint voltage is measured by a separate pair of joint probes that are directly connected across the joint of interest (fig. 5). After placing both couplers on a bundle and performing a loop measurement, the maintenance person switches the LRT to joint mode, and places the joint probes across the joint of interest. Once the joint probes make a connection, a joint measurement is started. By measuring the joints in the loop, the maintenance person can find the bad joint connection without having to remove the cable. Sensing of coupler closure and joint probe connection. The LRT can sense if a coupler is not closed adequately to complete a reading. This could occur if (1) something is stuck between the jaws of the coupler and the coupler does not close completely, or (2) the maintenance person put the coupler in a location that is hard to see and the coupler is closed on a bolt or some other piece of hardware. The LRT can detect these occurrences and notify the maintenance person before a bad reading is given. The notification is in the form of an error message on the LRT display. The LRT also detects if the joint probes are connected to the joint before a reading is taken in joint mode. The LRT was developed originally for use on the 777, the first Boeing commercial fly-by-wire airplane (see �777 Fly-By-Wire Maintenance�). Experience gained with the LRT identified many inherent anomalies in shielding systems. These anomalies exist undetected in other airplane models. Consequently, in 1997 the FAA released Flight Standards Information Bulletin for Airworthiness #97-16A on the subject of lightning/HIRF protection maintenance. The bulletin contained guidelines for FAA inspectors to use for ensuring that in-service airplanes maintain continued airworthiness against lightning and HIRF hazards. Each operator was requested to provide a lightning/HIRF protection maintenance program to the appropriate FAA district office for review and approval. This activity was required for all models including earlier airplanes with mainly analog electrical/electronic controls and displays although not all aspects of the bulletin would apply to the earlier airplanes. The bulletin resulted in additional airline maintenance requirements, increasing the value of the LRT as a tool to help operators reduce the time required to accomplish the maintenance. As of early 2000, the LRT currently was not mandated for use in the lightning/HIRF maintenance program for the 737-600/-700/-800/-900 models. A lightning/HIRF maintenance program is being developed for the 757-300, and one will also be developed for the 767-400 extended-range airplane later in 2000. It has not been determined whether these programs and others will require use of the LRT. Similar programs for the 717 and MD-11 airplanes call for visual inspection of shielding systems. In all cases, the LRT provides the fastest, most accurate verification that a particular shield circuit is fully operational and will provide maximum protection against lightning and HIRF incidents. Boeing designed the LRT for use in certain hazardous locations, such as on a fueled airplane, as well as nonhazardous locations. Safety features include added series resistance to the couplers, added series resistance to the battery to limit fault currents, and minimized capacitance in higher voltage circuits. The LRT is classified by the Underwriters Laboratories Inc. as intrinsically safe to the propane class of fuels (class 1, division 1, group D fuels), which includes jet fuel. Because the LRT can be used in depressions in the airplane where fuel vapors may collect, it carries the most stringent safety classification. This means the LRT can also be used inside fuel tanks to check bonding. As a piece of test equipment, the LRT must be calibrated and certified for accuracy at regular intervals. Because the LRT is nonintrusive, a new set of loop resistance standards for calibration and certification needed to be developed for its use (fig. 6). Large loop resistances (>1 ohm) are easy to calibrate because standard resistors can be connected in a loop. As the loop resistance becomes smaller, the connection between the resistors becomes a large portion of the loop resistance. The lowest value LRT loop standard is only about 5 milliohms, so the joints made in connecting the loop (typically about 1 milliohm) become a large portion of the loop. In addition, the loop standards for the LRT needed to be measurable by calibration equipment so the loop standards themselves could be certified and traceable to standards set by the U.S. National Institute for Standards and Technology. For joint standards, the LRT uses standard current shunts (fig. 7). The required calibration/certification interval for the LRT is one year. Calibration procedures are provided in the LRT ground equipment technical manual. 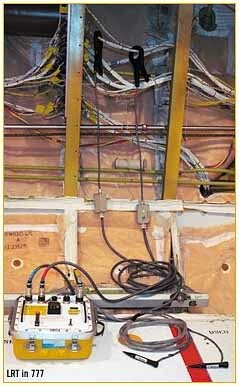 In the past, the commercial aviation industry has not identified cable shielding systems as candidates for regular testing throughout the life of an airplane. However, as fly-by-wire systems continue to be more widely used, it is highly likely that operators will be required to test the related shielding systems in airplanes. Historical obstacles to testing these systems have included the cost and difficulty of testing, the lack of testing opportunities during airplane production, and the ability to conduct only visual testing in the field. The LRT developed by Boeing offers operators a solution to these obstacles. It provides the ability to test cable shielding for all critical and essential systems, including fly-by-wire systems, and as a result can help operators increase safety of flight.